I’ve read and reviewed several cowboy romances, and have a grudging admiration for the genre. I’d rather read about cowboys than billionaires. I’ve also read and reviewed several historical romances, and they have a lot of appeal. The distancing of time is a great tool for suspending disbelief. 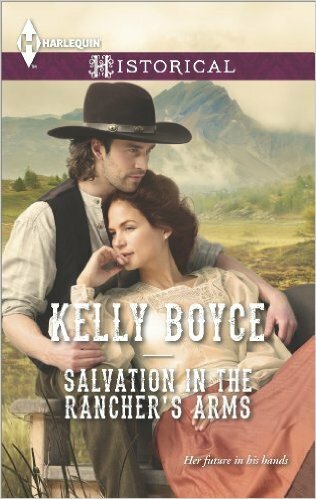 Kelly Boyce’s Salvation in the Rancher’s Arms (2014) is a cowboy historical, something new to me. It’s almost a classic western, except the stranger who rides into town to restore social order settles down instead of moving on. I love the setup. Caleb rides into town to deliver two things to Rachel: Her husband’s body, and the deed to her property. Very gentlemanly of him, although it’s no surprise that he had a more active role in acquiring these things than he initially admits. The unlamented husband is quickly buried, but the deed proves harder to hand over. Rachel’s neighbour Shamus is keen to have her land, and her as well, and the debts her husband left are the perfect opportunity for him to act. So long as Caleb holds the deed, her honour, her farm, and her children are safe. Caleb decides to stick around, to make things right. Rachel has her pride, and does not want charity. Nor does she want to end up like her mother, trading her body for survival. However, she accepts Caleb’s plan to save the farm. She does not have much choice, since, as Caleb points out, it is his farm now. They will both keep quiet about the deed. He will stay at her farm, supposedly as a farmhand, and pay her a modest wage, so that she can pay the debts. Proximity, the appeal of a capable man about the farm, and the appeal of a caring, hardworking woman, work their charms, and our couple are soon spending more time together than is appropriate for the lady of the house and a hired hand. There are two obstacles to happiness: The past experiences and recent events that discourage Caleb from settling down, especially with Rachel, and the threat of Shamus. One internal, one external – an example of how the story is well told. Conversations and growing trust help the internal obstacle, while the external obstacle supports an action/suspense subplot. Boyce does not sugar coat the options available to women at the time, although I’m a little disappointed that Rachel’s modest character growth/discovery of the sexual pleasures of a caring lover does not include a greater acceptance of her mother’s choices and lifestyle. The sheriff, suspicious of Caleb, is a little under-developed. He was once a suitor for Rachel, which perhaps explains his persistence in finding out exactly who Caleb is, but he’s not a rival now, and it’s never clear why Rachel turned him down. As for Caleb, he’s almost too good to be true, which I suppose is why he’s a good romantic hero. A common flaw with characters like him is the problem of why they are still single, but in this case the plot covers that. An interesting detail is that neither of the children are actually Rachel’s. Their backgrounds add some complexity to the plot and characters, however it also seems a bit of a cheat to have children in the story and yet still have the woman relatively young and virginal. I’m not sure whether to be impressed or annoyed. Boyce has written another story in this setting, where the Sheriff is the hero, as well as a series of Regency historicals. This was her first Harlequin historical, and started as a NaNoWriMo book. I’m looking forward to reading more of her work.